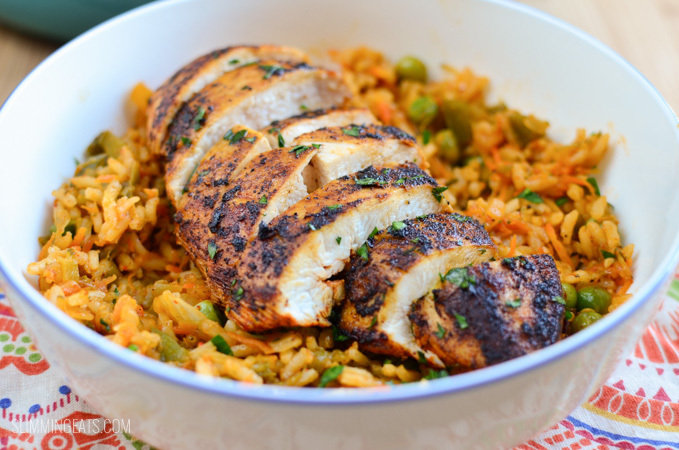 Deliciously seasoned Spanish Chicken and Rice – a dish you just have to try. 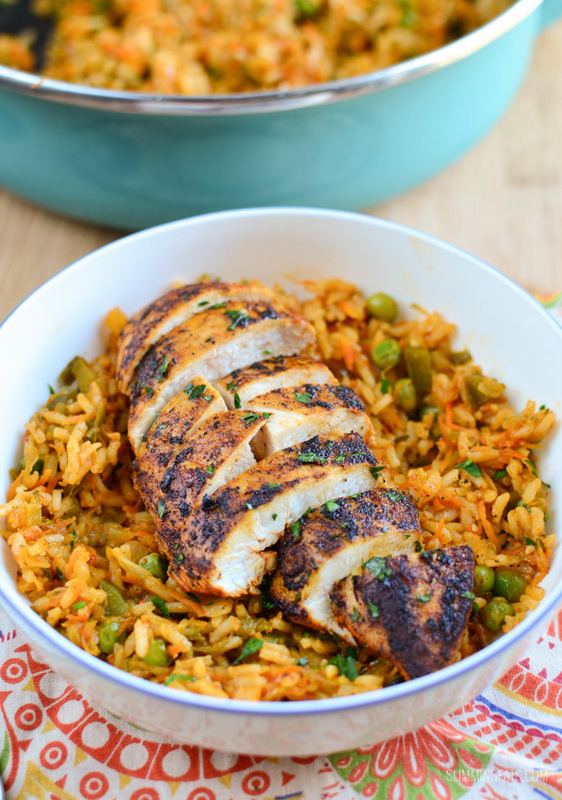 This Spanish Chicken and Rice is a pretty quick dish to put together, the chicken is so tender and has a flavorsome seasoning and the rice is just amazing pack with lots of veggies and never from a packet. 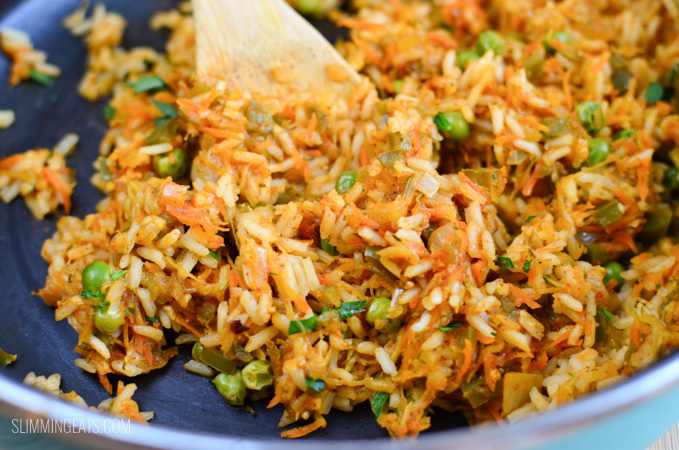 Once you try this rice, you will wonder why you ever used packet rices, this is just lovely and fresh and super easy to make and it really doesn’t take much longer to make, all you have to do is chop the veggies fry them in some spray oil before adding your rice and stock. I love the rice on it’s own, so adding the chicken is a flavour explosion. I cook my rice in a big cast iron skillet like the one below. I love my cast iron pans and have a set in various sizes including some that are not enameled and which add a great sear to meat, as the can easily be transferred from stove top to oven and vice versa. Chicken really doesn’t need a whole deal added to it to make it flavorsome. Just a good seasoning of salt, pepper and paprika is basic but delicious. Pan frying, adds a lovely golden colour while the rest of the breast remains tender. Far too often Chicken breasts can be overcooked and I only ever use them for dishes like this. For casseroles and stew etc I favour chicken thighs, which can be cooked for longer and absorb more flavour. It’s a great family meal that everyone will enjoy and is also gluten and dairy free. Spray a large saucepan with spray oil and fry the onion, garlic for a few mins to soften. Add the carrot, zucchini and pepper and fry for a further 2 mins. Add the rice and chilli powder stir to mix thoroughly. Add the tomato paste and chicken broth and bring to the boil, cover and reduce to a simmer until all liquid is almost absorbed (refrain from stirring rice in this cooking period), Add the peas just before the end of cooking time. Remove from heat and set aside still covered with lid so that the steam continues to cook the rice. In a bowl mix together the paprika with some black pepper and salt and rub the seasoning into the chicken breasts, spray a large grill pan or skillet with some spray oil and brown on both sides until chicken is cooked through and slightly charred. 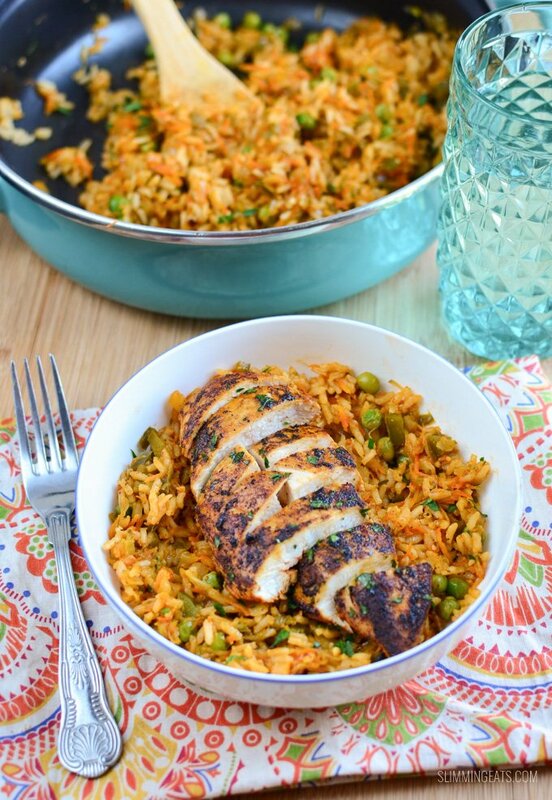 Slice chicken breasts and serve with the rice. Wow Ive just made this and its just as great as all your other recipes. Thank you so much for this blog as without it I wouldnt have been able to stick to slimming world, I need variety with my meals and as I am not a confident enough cook to prepare meals from scratch, your blog has enabled me to do this. Sorry, this is probably a stupid question but is it dry or cooked rice you are adding to the broth? Just made this for dinner using my instant pot for the rice 3mins manual with 4 min natural release, perfect.. Finely chopped courgettes and carrots instead of grating them as was too lazy to grate. Will definitely be on the menu again. Thanks so much for this! I follow you on Instagram and just so happened to stumble upon your blog through this today! I’m just starting out with this and really want it to be a success! Made this last night. So simple to do. Husband couldn’t believe it was a healthy recipe. Clean plates all round! Hi .. ive got 2 questions 🙂 how much rice I should add ? and what chicken stock ? normal cubes ? if yes then how many ? Hi, could you use brown rice instead? Just had to leave a message to say how GREAT this recipe was! Stumbled upon it by complete accident and am so glad I did! Full of flavour and a firm favourite in our house now. What’s great is how this can be tweaked to fit whatever ‘back of the fridge’ veg you have in. Thank you thank you! Hi Neil, the chicken is cooking on a hob in a frying pan or grill pan. Enjoy!! I really enjoyed this meal, it was very tasty & I liked the kick from the chilli powder. It was a good way to jazz up plain rice & get more veggies involved. Enjoyed leftovers the next day.